In Vitro Fertilization, which is commonly known as IVF, is a type of assisted reproduction technology to help couples with fertility issues getting pregnant. This medical procedure involves manually fertilizing an egg with sperm outside of the body and implanting the fertilized egg in the carrier’s uterus once fertilization in the lab environment is complete. Recent studies show that one in six couples worldwide struggle with infertility. Infertility is a condition of the reproductive system that involves the inability to conceive. Infertility is a condition that affects both men and women. The success and availability of in vitro fertilization have given hope to many infertile couples who have not been able to conceive. Since 1978, 5.4 million babies have been born worldwide with the help of IVF. According to a study carried out by Fertility Clinics Abroad, 93% of couples undergoing fertility treatment or considering it, have thought about going abroad to get treated. High costs in their home country seem to be a determining factor: 68% say they would consider treatment abroad because of more affordable options. In England, where the NHS is cutting back on IVF treatment, an increasing number of singles and couples are considering other available options abroad. Local NHS providers in the UK decide how many IVF treatment cycles to fund. As a consequence, different areas have different regulations: while in Scotland women can get three full cycles of NHS-funded treatment, some areas in England have been restricting or halting the funding significantly since beginning 2017. While cost plays an important role (the average cost of one IVF cycle in the UK is £6,200, or €7,000), it is not the only matter of concern for singles or couples who wish to have a family. 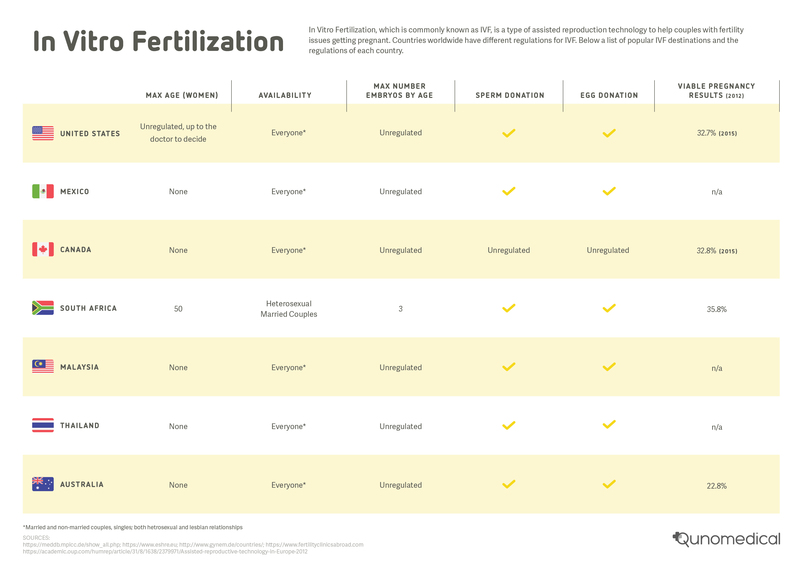 Each country has specific regulations as to what age in vitro fertilization is allowed, the number of embryos that can be implanted, and if donor eggs or sperm can be used. We have analyzed costs and regulations in the most sought after destinations in Europe for IVF treatment (Germany, the UK, Poland, Spain, Ukraine, Czech Republic, Denmark, and Turkey) to give you a clear overview of what options you have if you are considering getting IVF treatment in one of these countries. In Europe, available data is examined by the European Society of Human Reproduction and Embryology (ESHRE), which is in charge of recording and reporting on successful or unsuccessful IVF cycles throughout countries. The success rates reported in the overview below refer to IVF treatments carried out in 2012 and the report was published by the ESHRE in August 2016. Costs below represent the average price of one full IVF cycle using own eggs. In the next overview we have collected available data for the US, Canada, Mexico, South Africa, Malaysia, Thailand, and Australia. 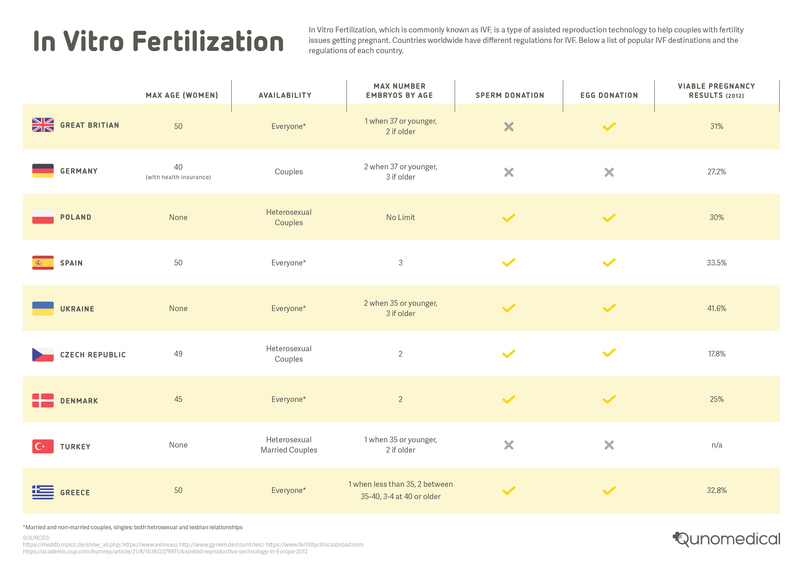 Most of these countries seem to have a less regulated system for in vitro fertilization treatment than European countries. Given much lower costs, Thailand, Malaysia and South Africa are popular destinations for American and Australian patients. Success rates reported in the last column of both tables represent single full IVF cycles resulting in pregnancies. Comparing success rates across countries is not always simple as not in all countries it is mandatory for infertility clinics to submit results. Moreover, average success rates per country should be examined carefully given the different regulations and specific conditions of women undergoing treatment. Success rates depend on patient characteristics, such as age, infertility diagnosis, number of embryos transferred, use of techniques, history of previous births or miscarriages. What country should I choose for IVF? The overview tables of regulations and costs may serve as a starting point for your search. When picking a destination, and more specifically a clinic, it is important to check and compare the relevant information for your individual situation, such as success rates specifically for your age group, condition and treatment. Embarking on a cycle of in vitro fertilization involves hormonal stimulation, injections and some emotional discomfort. Therefore besides success rates, your decision should be based on other factors such as confidence, comfort, and convenience.